Sandra Rodriguez Gonzalez studied Chemical Engineering at University of Malaga (Spain). She obtained a PhD in Chemistry from the same university in 2012, under the supervision of Prof. Juan T. Lopez Naverrete and Prof. Juan Casado, with a thesis entitled : “Evaluation of Charge Delocalization in the Doped Forms of Semiconducting Organic Oligothiophenes by Raman Spectroscopy : p-Dimers, Polaronic Species and Mixed-Valence Systems”. 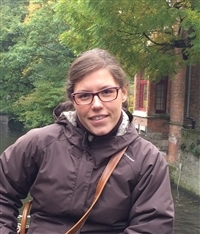 Currently, she is a Postdoctoral fellow in the Laboratory for Chemistry of Novel Materials at the University of Mons (UMONS). Her work involves the theoretical characterization of the electronic and transport properties of molecular junctions, in order to understand the fundamentals of transport across the molecule and the modulation of the electrical conductivity on the functionnal nanodevices. Her studies are based en the coherent Landauer’s picture of conductivity within a NEGF-DFT formalism. Diradicals acting through diamagnetic phenylene vinylene bridges: Raman spectroscopy as a probe to characterize spin delocalization. Sandra Rodríguez, Belén Nieto, Rafael C. Gonzalez, Vega Lloveras, Juan J. Novoa, Fernando Mota, José Vidal, Concepció Rovira, Jaume Veciana, Elena del Corro, Mercedes Taravillo, Valentin G. Baonza, Juan T. López Navarrete, Juan Casado. The Journal of Chemical Physics, 140 (2014) 164903 (1-9). Delocalization-to-Localization Charge Transition in Diferrocenyl-Oligothienylene-Vinylene Molecular Wires as a Function of the Size by Raman Spectroscopy. Sandra Rodríguez, M. Carmen Ruiz Delgado, Rubén Caballero, Pilar De la Cruz, Fernando Langa, Juan T. López Navarrete, Juan Casado. Journal of the American Chemical Society, 134 (2012) 5675-5681. Enhanced Functionality for Donor-Acceptor Oligothiophenes by means of Inclusion of BODIPY: Synthesis, Electrochemistry, Photophysics, and Model Chemistry. Daniel Collado, Juan Casado, Sandra Rodríguez, Juan T. López Navarrete, Rafael Suau, Ezequiel Perez-Inestrosa, Ted. M. Pappenfus, M. Manuela M. Raposo. Chemistry A European Journal, 17 (2011) 498-507. The Frontiers of Quinoidal Stability in Long Oligothiophenes: Raman Spectra of Dicationic Polaron Pairs. Sandra Rodríguez, Yutaka Ie, Yoshio Aso, Juan T. López Navarrete, Juan Casado. Journal of the American Chemical Society, 133 (2011) 16350-16353. Diferrocenyl oligothiophene wires: Raman and quantum chemical study of valence-trapped cations. Sandra Rodríguez, Juan Aragó, Pedro M. Viruela, Enrique Ortí, Juan T. López Navarrete, Masa-aki Sato, Juan Casado. The Journal of Chemical Physics, 135 (2011) 234705 (1-5).